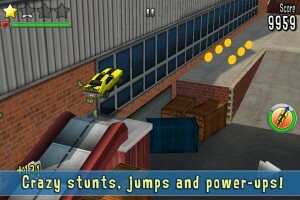 “Reckless Getaway” Review- Guilt-Free, High-Speed, Car-Wrecking Fun! Reckless behavior will get you many undesirable places in life like the bottom of a toilet, top of a building, and being chased by twenty cop cars. In this game being reckless is your main goal and destroying tons of cars with a awesome maneuver will certainly put a smile on any ones face. With lots of content including 17 levels, 2 game modes, and 2 different cars the fun wont be coming to a halt anytime soon. The main catching point that got me hooked on this game is the floaty physics. Sure some people like down-to-earth physics that make games play like a rock but the physics in this game let it have that extra element of unpredictability. The two modes I mentioned before are Getaway and Wreckless. Getaway is basically the main campaign of the game. There are 4 different sets of levels each consisting of 4 levels each. These sets of levels have their own backstory and their own environmental theme like the dessert for instance. You unlock new levels and modes by earning stars in the previous levels. A star meter fills up depending on how many coins you pick up along the route and how much destruction you caused while driving….recklessly. Hidden along the level are little sub routes that deviate from the main course of the level. Often you will find way more coins and quickly elevate your star total if you can find them. 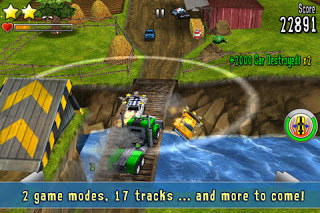 The second game mode, Wreckless is designed for the more destructive type. You are outfitted with a big rig and in order to gain the stars mentioned previously you have to destroy as many cars as you can which as you can imagine is amazingly fun. In both modes there are various power ups located randomly around the track. It’s the star rating system that really gives the game good replay value but after you complete everything there is little else substantial to work your way up to besides the GameCenter achievements. Fortunately the overall fun of the game makes up for that discrepancy and works this game to the top of my favorite games list. I highly recommend you check out this awesome and action packed game. Difficulty: Ranges per each level but is by no means a difficult game.